Marek Pramuka was born and raised in the Central European country of Slovakia. At the young age of 13, just months after the fall of the Iron Curtain, Mr. Pramuka was recruited to join Canada’s oldest private school on the Atlantic shores of Nova Scotia. His pursuit of the American dream and college education brought him to the prestigious Deerfield Academy in Massachusetts. He played competitive ice hockey through most of his high school and college years and still plays recreationally. 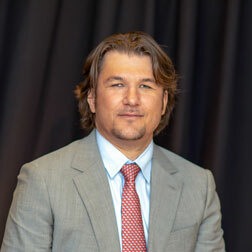 His college team at the University of Wisconsin Superior took second place in the 1999 NCAA Ice Hockey Championships and he played on Slovakia’s European Inline Hockey Championship team in 1997. He and his wife, Michaela, raise two children, Pierce and Easton. An avid golfer and frequent traveler, Mr. Pramuka enjoys attending student games and performances.